Last week a new student contacted me regarding an educational install of AutoCAD, and an odd error code that did not bring much from Google. On first run, this error flags and shuts them down. After some research I came up empty, except that some other folks had similar issues, but no one commented. So I suggested the “reinstall option” and checking the user rights. User rights was the ticket. Make sure your user account has sufficient rights to ADLM, file and template structures, and any the Program Data file locations. Autodesk posted a writeup on the trojan we mentioned earlier. There is a script and some search and destroy. The Civil 3D 2010 Update 1 is available at the Autodesk service release site. I have updated and corrected the links for both Civil and Civil 3D, but the “…Autodesk product could not be located…” error is still there, no matter where the service pack was received from. If anyone else is having the same problem, please post your issues here for the community. General – AutoCAD Civil no longer closes unexpectedly when you run the LIST command on AutoCAD Land Desktop entities. Alignments – Sample lines of an alignment that is a data referenced object no longer disappear when you use the RECOVER command to open the drawing containing such alignment. A lawsuit has been ongoing since August of 2007, regarding Mr. Vernor’s alleged sale of R14 on ebay. Some aspects of the case have been settled but the ongoing current issue appears to be Copyright law and the EULA. It’s touted as the Big Bad Wolf is squeezing Little Red Riding hood. It would appear that way, perhaps if I just looked at the headlines, and the face value information. There has been considerable discussion about the possibility that the software was already upgraded, at a reduced upgrade fee (there was also a statement that this was not in the case documentation). If it is true, then the individual accepted an agreement to upgrade or move up to a new product at a reduced cost, and subsequently stop using the old version. If the product was upgraded, the original is now UPGRADED, and no longer exists. You can’t sell something that doesn’t exist. But of course the tiny detail that Autodesk says in order to purchase the license, you agree not to release any portion of the software to any third parties. Right or wrong, the statement is in there. Read the EULA. I read all of the agreements and summaries that go along with the products, including trademark uses, etc. I don’t agree with every detail in there, but I do know before I purchase, that the general idea that I can’t sell it again without written approval for Autodesk. Here is a problem some VISTA users have. The DWG import wizard viewer “Selective import” control is empty. One reason is of course VISTA, but another may be because of constant uninstall and reinstalls of Design Review. I have not confirmed the latter, but I do suspect it. I went looking for some info on this, and found the ‘known issues’ list in numerous places. 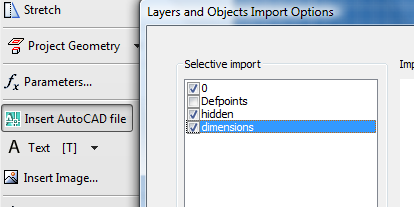 The DWG import wizard viewer “Selective import” control is empty: You may notice in the DWGIN wizard’s viewer page that the “Selective import” control is empty (this control lists the layers in a DWG file). This indicates that a module needed by the viewer is not registered (because a lack of user privileges). Tekni is still giving away promotions for the new 2011 courseware. Register before 12/31 deadline to get a chance to win. The solid fill patch has been out for awhile, but because I never remember when setting up Raster, I thought I’d remind everyone else. Close all Autodesk applications and replace the XML file supplied. The readme will explain everything. Type MTextEd at the command line and then type OldEditor in the command line. Now the Mtext will utilize the old editor like in previous versions. Before you get working in a drawing, whether it’s new or not, you might want to check your angular settings. Go to your settings and right click on the drawing header at the top of the list. Select the Ambient Settings tab, and scroll down to Angle, and to Direction. In the Format field for both, select (decimal dms). This is where you can format the input of the prompts. After you change these settings you should pay close attention to the command prompt during input. The system will indicate what input format it expects. You should see Decimal DMS come up. While you are in there, you might want to check your Units tab as well. Make sure that drawing is set to US Survey Foot. When you start seeing XML transfers go bad, this may be why. In this exercise we will begin with the data imported in the previous posts, Import points scenario. In this post we will Import a point group into an existing surface, and edit the surface to get rid of any legacy data.